I love food. I love food and when Dr. Terry Wahls tells me that I may be able to reduce or “cure” the symptoms of Multiple Sclerosis (MS) that I have if I change my eating habits I confess, I wasn’t happy. However, the more I researched and the more people I talked to about going Paleo I realized that eating Paleo does not mean I have to be deprived! I’ve been brainwashed to believe that food has to be loaded with garbage in order to be amazing. I recently tried my hand at making my own almond flour because it’s so bloody expensive in the stores. It was actually very easy and I look forward to making it for whatever I need, again, in the future. While I was working with the processing of almond flour I realized that it might make a good replacement for Panko bread crumbs and tonight I was inspired to make a great big, fat chicken breast in a panko inspired manner. I looked for panko recipes on line and came across a Dijon Chicken With Panko Crust recipe (posted below) which I attempted to make. 1. In a large bowl, whisk together butter, mustard, and garlic. In another bowl, mix panko, parmesan, and parsley. 2. One at a time, turn chicken breast halves in butter mixture to coat completely. Dip rounded side of each breast in panko mixture. Place breasts crumb side up in a 10- by 15-inch baking pan. 3. Bake chicken in a 400° oven until crumbs are golden and breasts are no longer pink in center of thickest part (cut to test), about 20 minutes. Check to see if ready and add 5 minutes at a time until fully cooked. Place 1 or 2 breast halves on each dinner plate. 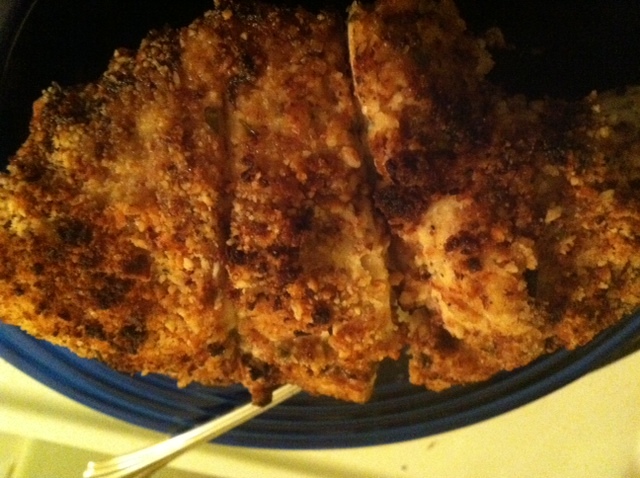 I initially followed the original recipe’s instructions to cook at 500, however, after 20 minutes the chicken was under cooked and the breadcrumbs were starting to burn. I’m opting for lower temps at longer cook times. The results? DELICIOUS! I must say that the 2 tablespoons of parmesan cheese really makes it buuuuuut if you don’t do cheese, you’ll miss out. It’s amazingly tender and juicy and, again, DELICIOUS! I scraped up every juicy yet crunchy bit of the breading with each bite, as well. Perhaps some sauteed asparagus or steamed broccoli to accompany your Paleo Panko Dijon Chicken with a nice warm cup of tea and some Paleo Chocolate Chip Cookies and frozen blueberries later. By the way, the original recipe says it makes 8 chicken breasts but I have no idea how that’s possible when for a large breast I barely had enough of the “flour” mixture which is why I say that it makes only 2 breasts. As a recent Paleo convert I am quick to search out recipes for some kind of sweets, especially chocolate. I seem to have a weakness for homemade chocolate chip cookies so I wanted to make sure I knew that I could easily, and “legally” have them if I wanted. I found this particular recipe after reading Baker Gal blog and subsequent success. Besides, I don’t know about you, I’m not good at feeling deprived and, coupled with my disdain for anything that’s discribed as, “you get used to it” I am bound and determined to enjoy my life and the Paleo way of eating! 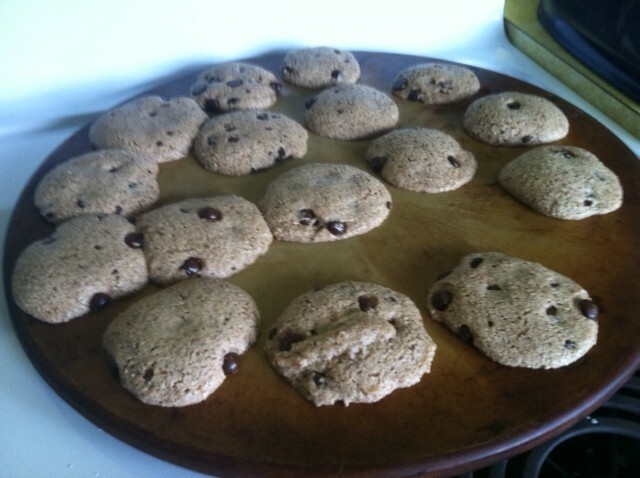 The quest for the “perfect” Paleo chocolate chip cookie meant that I sought out recipes that had ingredients that I enjoyed and/or had on hand, already. This one called for almond flour and I had come to the conclusion that I needn’t always spend a lot of money to eat well. 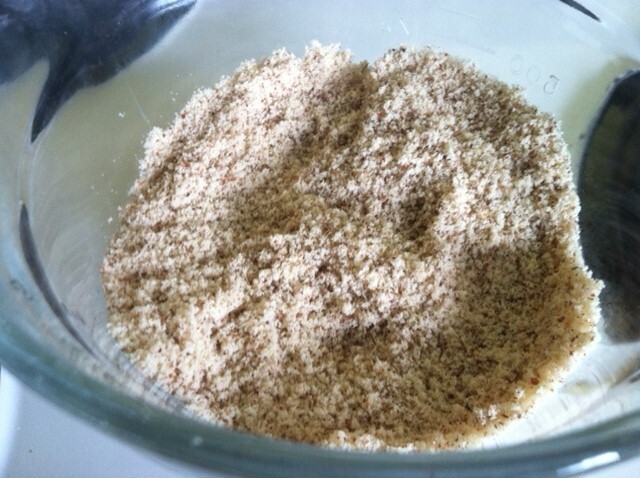 I decided that I have almonds in the house, in various forms, and was going to make my own darned almond flour! When the bulk bins at New Seasons has almond flour priced at $8.99 a pound, there had to be a better way. I have been purchasing my nuts at Winco in their bulk section for $3.98 a pound, albeit they aren’t organic. At the moment I am trying to eat organic whenever the part that I eat would have been sprayed directly with pesticides so almonds are on my safe list. After searching the web for directions I threw whole, raw, almonds into the food processor (about 1 1/2 cups but that’s an approximation) then transferred them, small batches at a time, into the blender (do yourself a favor and give the almonds the sniff test before you start your efforts as my first attempt had odor from the freezer on them. I had to toss the stuff out, wash everything involved, and start over. Learn from my mistake). I suddenly realized that I had a flour sifter and that helped to thin out the larger chunks of almonds, I threw them back into the blender and soon had the 5 oz of fine almond flour that I needed! Take that New Seasons (I like New Seasons, I just don’t always like the prices attached to some foods)! I posed the question on the Facebook page, “Eat Fat, Get Fit,” could I swap out the recipes 1/8 cup macadamia nut oil for equal part coconut oil as I have the one and not the other. The blogger and the groups general concensus was to go ahead and give it a try. I confess that I adore the smell of coconut oil! Smells like an Almond Joy every time I open it and any excess goes on my lips or dry elbows to keep them smooth. 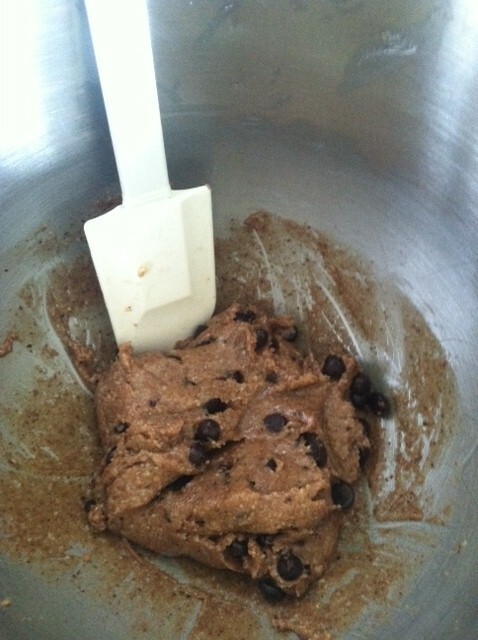 The cookie batter before heading to the cookie sheet. I made the mistake of not fully reading the directions and failed to add a teaspoon of water to the honey and withhold the chocolate chips I use Sunspire as they do not contain soy lecithin, which I avoid. Very difficult, indeed, to find chocolate that doesn’t contain the product or some other type of lecithin. However, I did add the water in time and the chips made things take longer to mix up, I believe. I used a small scoop for the batter and a spatula to smash them down, according to the recipe as they don’t spread out when cooked. Actually that’s kind of nice because you know how much space they will take up. The recipe called for 6 minutes ad 325 but I found that they were still raw at that point so back they went for 2 more minutes. I took them out and left them on the stoneware while I took the dogs for a walk as the stoneware continues to cook as it cools down and I didn’t want to try the cookies too soon before they were ready. Cookies scooped onto the cookie sheet then smashed since they don't spread out when baked. The results? First the batter tastes good, on it’s own. These don’t taste like traditional chocolate chip cookies but they definitely fulfill the desire for them! They are chewier than a traditional cookie but I like that aspect. Perhaps cranking the heat to 350 and increasing the time will give them the crunch to chew ratio of the cookies I’m used to? There is an after texture that’s similar to nut butters where you keep finding bits of nut still in your mouth but it’s certainly not unpleasant. When they cooled they went straight into the freezer where I can enjoy them one or two at a time. 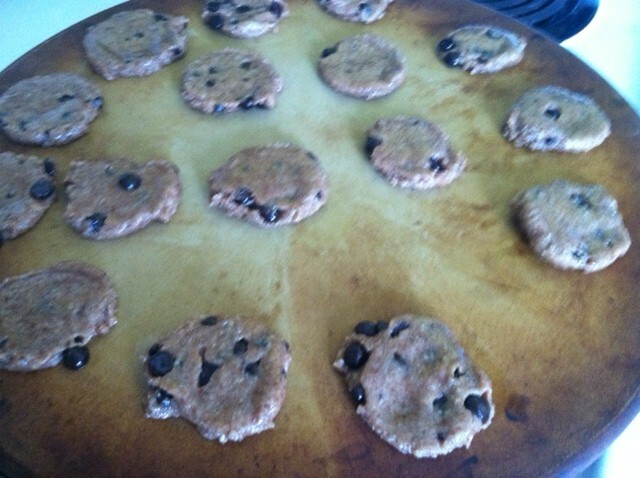 Paleo chocolate chip cookies hot from the oven! I hope that you will be able to enjoy these cookies, as well, and remember the healthy fat that IS in the cookie and the flour that is NOT in them. 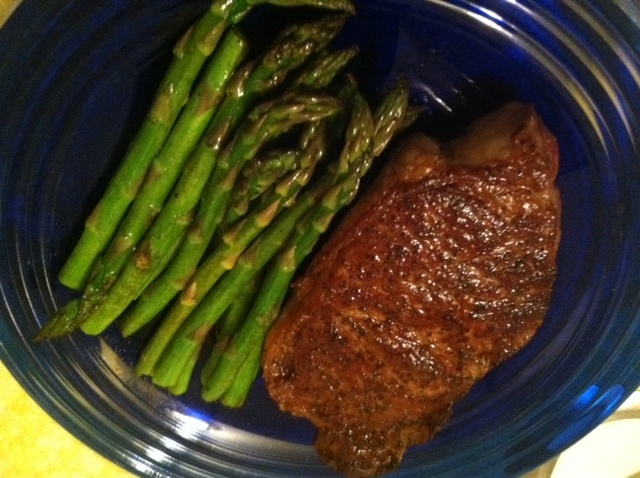 Tonight I used a 1″ thick New York steak which I peppered and sea salted. Then Preheat the oven to 400 degrees. I put a pan on the stove (the best pan would be a cast iron skillet but I do not have one, unfortunately) and turned the heat up to medium. When tossing a few beads of water onto the hot pan caused the droplets to evaporate, immediately, I dropped about 1/2 tbs of pepper cured bacon fat and braised the steak for 3 minutes before turning it and braising it for another 3 minutes with another 1/2 tbs of the bacon fat. Place the steak in a 400 degree oven (in the same pan you cooked it in if it’s safe to that temperature) for 6 minutes. Steaks cooked this way are turning out to be absolute juicy perfection. “A little over three years ago, the USDA defined “grassfed” as a new kind of meat, one that provides a better life to cattle, less environmental pollution and, often, a healthier cut of meat. Grass-fed beef cows are raised on a diet of nothing but their mother’s milk and grass, which provides a more natural growth for the cow and makes the meat more nutritious—with around 10 times more beta-carotene, three times more Vitamin E and three-times more omega-3 fatty acids. That said, beef is still higher in saturated fats than other proteins. Currently, most cows are fed a grass diet temporarily before being confined and switched over to a diet of grain coupled with hormones to speed up growth and strength. This unnatural diet, coupled with cramped conditions on feedlots, can lead to disease-spreading E. coli bacteria building up in their guts. E. coli is a leading cause of food-borne illness, and frequently prompts large recalls of beef and other meats. By eating only grass-fed beef, you are choosing a more humanely raised animal, allowed to grow at its own pace and with little worry about disease running rampant. The only downside is that due to the slow pace of keeping cows on this diet, it’s tough for producers of grassfed beef to keep up with demand for the larger retail markets, which means prices are often significantly higher than for comparable cuts of beef. The American Grassfed Association recommends going straight to the producer and provides a convenient list by state for you to start researching how fast you can make the switch to a greener beef. I decided that there was no need to paraphrase what this site provided so here it is, cut and pasted, along with the link. When you have arthritis, Multiple Sclerosis (MS) or any other autoimmune disease you want to avoid foods that cause inflammation and the omega-3 fatty acids found in beef are anti-inflammatory! As for The Blood Type Diet the Type O thrives on beef so, as you can see, I can find no reason not to eat a nice piece of beef. I started searching the web for Paleo recipes that I would enjoy and found http://paleodietlifestyle.com/. Some of the next couple recipes you will see here come from this site. I am not a person for which the argument, “you eventually get used to it,” should even be attempted. I will not continue putting something past my lips that I have to “get used to.” No way, no how. If it isn’t tasty, I don’t want anything to do with it. So if I say something is good, to my pallet, it definitely is worth the try. Honestly, I won’t post a recipe that I don’t have the urge to try again, even if I have the urge to alter something. With that said, my first recipe from the site was the Chicken With Creamy Sun-Dried Tomato Sauce http://paleodietlifestyle.com/chicken-sun-dried-tomato-sauce/ which was quite good. The next time I fix the recipe I plan to add just a touch of honey to sweeten the flavour of the sauce. Otherwise it was reminiscent of a dish that I enjoyed at the Sticky Wicket in Victoria BC. I realize that sweets are definitely out in some Paleo programs but I just have to enjoy some sweet, here and there, and stick as close to Paleo as I can when I do. Remember in a previous post that I noted how amazingly beneficial the asparagus is to the human body so here it is on my plate, again! Quite an excellent meal and one that I recommend that you try as well. Part of the Paleo diet’s draw is that you don’t have to weigh, measure or count anything, you just eat the foods that are beneficial to your body. However, I’ve opted to start recording what I’m eating so that I can keep track of how consistent I am being. We’ve all heard someone that we’ve spent the day with talk about how “good” they were or how little they eat and realize that they are completely oblivious to the food that they’ve put into their mouth. It will be nice to look back and see how much “unpaleo” food I’ve consumed in a day, especially when I wake up the next morning with or without allergies. I opted to go with https://mynetdiary.com/logonPage.do which I can update both on line and via an app on my phone. One of the first things I’m learning about eating differently has nothing to do with nutrients, their names or their affects on the body, studies or websites. One of the first things I found out was that if you are not a consistent housekeeper you had darn well better become one. 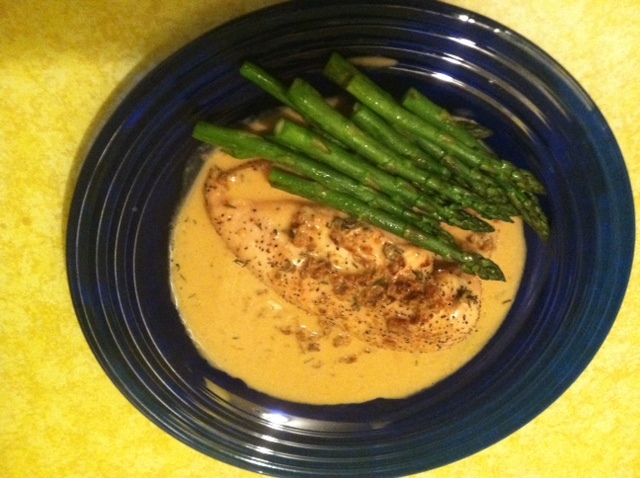 The dirty, cluttered kitchen does not inspire one to get creative or cook something, even the simplest dish. Not to mention that if you do find yourself in the mood to prepare a meal, if you hadn’t washed the dishes from the meal before, your choices for preparation is limited. Of course I have to prefer quality cookware and knives that can’t go in the dishwasher (I’ve been guilty of letting dishes that go in the dishwasher sit out, too). Could a Paleo diet improve my housekeeping? If it does, it will be begrudgingly so. My very first Paleo type meal was breakfast (one of the blogs I’ve read (after I’ve already started) indicated that starting is often better if you start with breakfast for a few days, since it’s often the most grain filled meal of our day) in which I started by frying up bacon pieces (New Seasons in Oregon sells bacon pieces for $2.99 a pound, great for not wasting bacon if you aren’t interested in eating it at the time). I then added a handful of asparagus spears, put the lid on the pan and let them steam for a bit before adding orange peppers and chopped onions. Finally I added 2 scrambled up eggs and scrambled them up with the veggies. At the last moment I added about 1/4 cup shredded mozzarella that I happened to have on hand. Milk is something that I’m supposed to avoid on The Blood Type Diet as well as eating Paleo but, you know, it’s in the house, why waste it… and I love cheese! Quite a nice meal though I did use ketchup (sorry, it’s how I roll where eggs are concerned) and it had corn syrup (though I did see a version of Heinz Ketchup at the store, recently, that was made with cane sugar! Still anti Paleo but it’s good news for those who are trying to rid their lives of the hated HFCS). I’ll give fresh salsa a try, next. My First Paleo Meal: Scrambled Eggs with Veggies Cooked in Bacon Grease. You’ll see me dining on a fair amount of asparagus, when the seasons allow, because of the health benefits. For instance asparagus is rich in anti-inflammatory nutrients. Inflammation aggravates auto-immune diseases such as Multiple Sclerosis, for example. Asparagus also acts as a diuretic which helps to reduce bloating due to PMS and helps to reduce the swelling of both arthritis and rheumatism. It’s rich in vitamin B12 and I have a family history of Pernicious Anemia, or a B12 deficiency. Asparagus is also a prebiotic which provides food for the probiotics that live in your intestines and help to aid in digestion. It’s also an antioxidant which helps to reduce our risks of cancer. Now this is something we should all be interested in but if you are on immunosuppressive therapy, you really need to do what you can to reduce your chances of cancer because your medication is suppressing your bodies ability to fight cancer cells. As was explained to me by my Dermotologist, we all have cancer cells developing in our bodies but our immune system fights them and they don’t develop any further. Antioxidants help to fight those cancer cells so you want to eat as much as you can, especially, if you’re on immunosuppressive therapy. Remember, food is a far better medicine than popping pills, if you can avoid it. Good nutrition can improve your health where as crappy nutrition can cause the body harm. Where does the Paleo aspect come in, here? 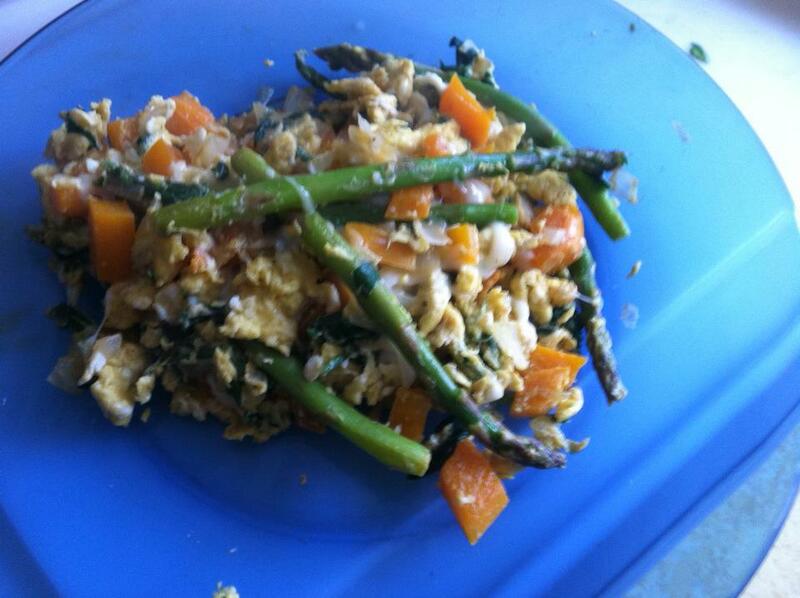 Organic eggs and veggies sauteed in nitrate free bacon grease. The only thing that wasn’t Paleo (remember, I’m imperfect as a Paleo, but working on heading in the right direction) was the 1/4 cup of Mozzarella cheese. Normally I would have had as much extra-sharp cheddar cheese that I could have gotten in there. I may be absolutely wrong in everything I just wrote so do your own research and feel free to share your knowledge with me if you feel that I’m wrong, though, please sight your source so that we can all learn. Please know that I really, really enjoy junk food. I don’t really discriminate, either; sugar, chocolate (you may think it’s the same as sugar but it simply must be in it’s own category), salt, fat, alcohol… I think that if it’s bad for us I just may be someone who enjoys it. With that said I have decided to start adding food into my diet that supports optimum health. I will be using a number of sources and providing links for things that can be found on line to back up my thinking. I AM NOT A SCIENTIST, PHYSICIAN, DIETITIAN, NUTRITIONIST OR ANY OTHER TRAINED OR LICENSED ANYTHING! I am simply someone with the disease of Multiple Sclerosis who wishes to find the best way to eat to maintain or improve their health. To begin this journey I am doing what I can to follow the direction of Dr. Terry Wahls who has done much reading on how nutrients affect the myelin sheath and has started doing research on the matter beyond the reversal of her own symptoms. I will also be using the book by Dr. Peter D’Adamo, “Eat Right For Your Type.” I have found it quite beneficial when followed, in the past, both by myself and my friends. I’ll be making notes as I go along as to how each one fits into the foods that are best for my health. The only weighing or measuring I will be doing is during recipe preparation and ensuring that I’ve had a minimum amount of certain nutrients or for the benefit of the reader. I hope that you enjoy reading about my journey but feel free to share you’re thoughts and ideas, contradict me and share links to facts as you understand them. Here we go!